signageOS is at the forefront of transformation in the digital signage industry from the heavy reliance on hardware to more software driven innovation. Our goal is to eliminate the fragmentation of different SoC, external players, and operating systems in the digital signage industry. The signageOS technology unifies the way CMS companies and managed solutions companies look at hardware and software integrations. This new approach will tremendously benefit customer-centric companies and end-users by allowing them to choose the correct and most cost-effective solutions for every network. We would like attendees to know the days of marrying one hardware solution are over. After years of development working with each platform, we decided it was truly time to bring about a positive change and help the industry find the standard API for different digital signage hardware. Thus we decided to release signageOS Open, the signageOS proprietary JS API, at no cost. CMS companies can now freely develop their unique CMS features and utilize their code on top of a single codebase for any SoC or media player integration. For more complex and demanding networks signageOS offers the full-featured signageOS Platform, which is the complete package. On-boarding and development support, maintenance, full device management features, infrastructure monitoring, and automated testing are just a few of the benefits that come with the signageOS Platform. Attendees should stop by booth #3200 to not only discuss the signageOS solutions but also what the future of the digital signage industry looks like with innovative technology like signageOS constantly emerging to bring about new changes. Our services portfolio has a lot to offer to CMS providers, network distributors and integrators, managed solution companies, OEM’s, and really anyone who is ready to eliminate their compatibility issues with digital signage hardware. 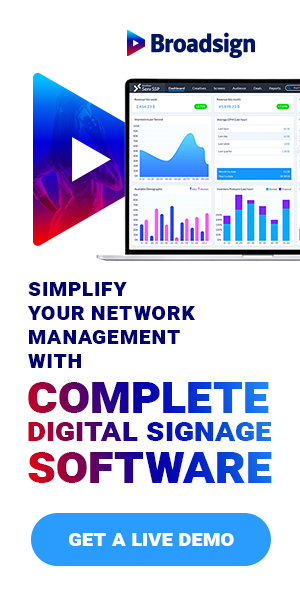 Anyone who envisions the future of digital signage with less fragmentation, more customer-centric and cost-saving approaches to installations should stop by the signageOS booth. signageOS was officially launched last year at DSE, so we can say that we haven’t missed a show since the inception of signageOS. DSE is always very busy, as you only have 2 days to meet all partners and friends. We will be visiting a lot with OEM’s, network distributors, and CMS partners. At our first DSE we were a part of the Launch Pad Zone, aka startup zone, so that’s where we will be looking for new industry innovation and spending some significant time away from our booth. Our favorite part of the week is just getting to see the newest innovations and exploring emerging tech. We truly enjoy seeking out and exploring the technology that will be the future of digital signage.